Panasonic has announced the HDC-Z10000 an integrated twin-lens 2D/3D camcorder that can shoot in the AVCHD 3D/Progressive standard. The camera features a parallax-barrier LCD that allows the 3D footage to be reviewed on-camera without the need for special glasses. Its adoption of the latest AVCHD standard allows it to shoot 1080p60 footage in 2D and up to 1080i60 in 3D, as well as offering 30p and 24p options. The camera essentially combines two of the company's 3MOS camcorders in a single body, offering 30-369 equivalent F1.5-2.8 zooms (32-320mm in 3D mode), stabilized for both 2D and 3D shooting. 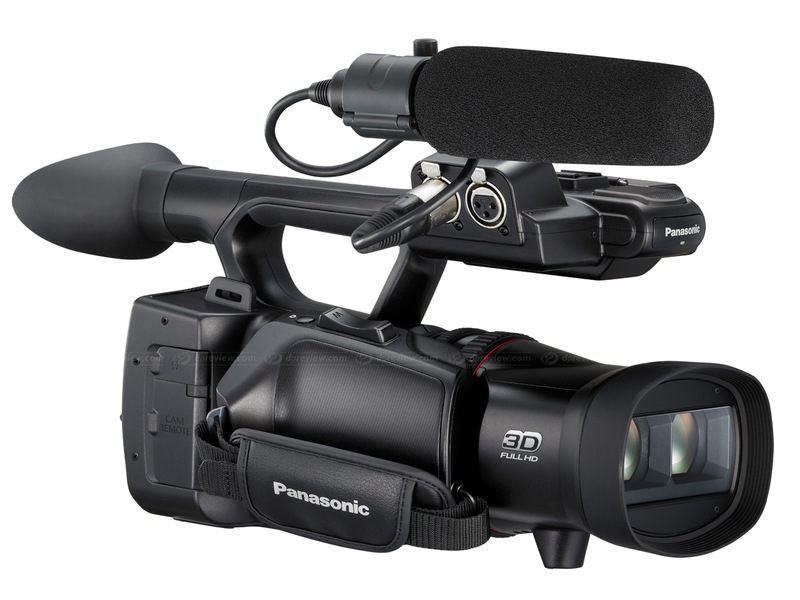 SECAUCUS, NJ (August 31, 2011) – Panasonic today announces the HDC-Z10000, its first*1 integrated twin-lens 2D/3D camcorder that is fully compatible with the AVCHD 3D/Progressive standard, which was also recently announced. 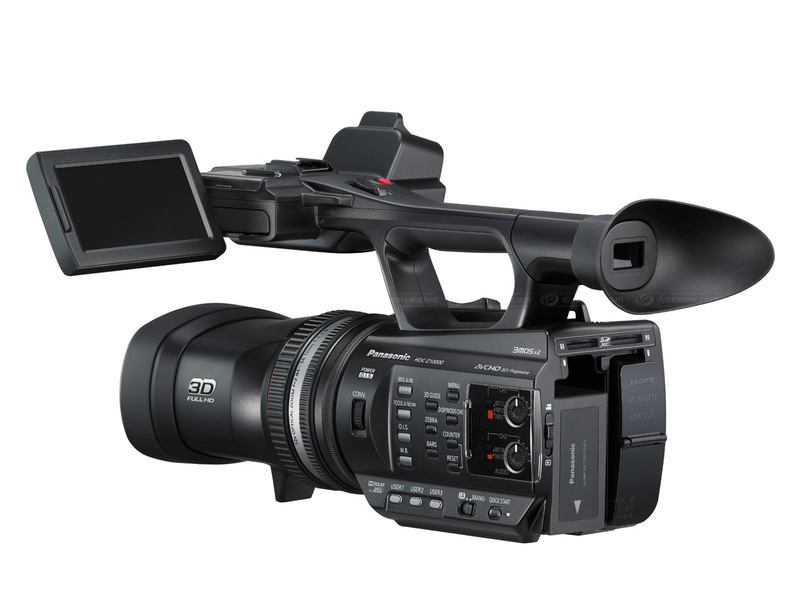 The HDC-Z10000 builds on Panasonic’s 3D innovations, having the closest 3D video macro setting with a twin-lens 3D camcorder at approximately 17.8 inches. With this industry-best macro setting, the Panasonic HDC-Z10000, helps capture 3D video that is typically difficult to do, such as flowers, animals and jewelry. 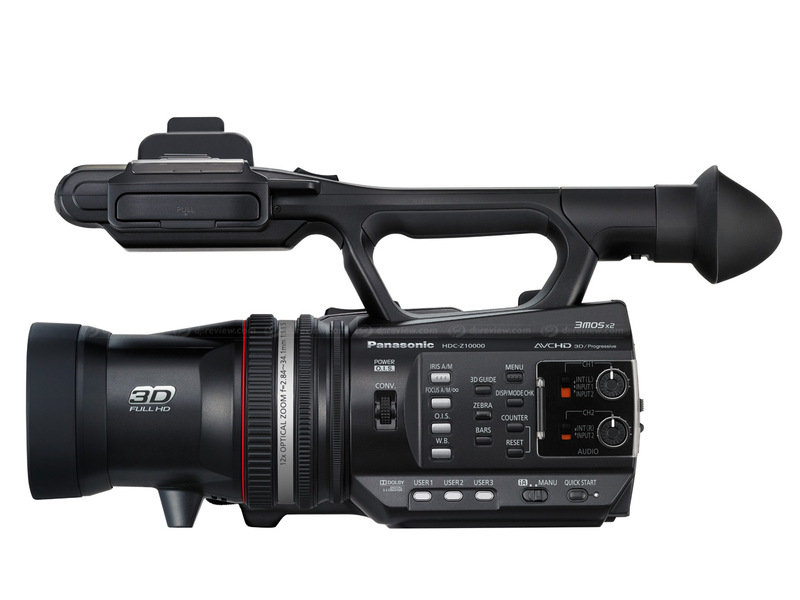 New to Panasonic’s 3D-capable camcorders, the HDC-Z10000 features a 1,152,000-dot, 3.5-inch LCD that appears 3D to the naked eye – no 3D eyewear needed. By using a parallax barrier to control the direction of the light from the LCD, images with slightly different perceptions are viewed by the right and left eyes, thus creating a 3D effect. The user can check 3D images while shooting, without having to connect a monitor. Naturally, the display can also be switched between 2D and 3D. Furthering its technical excellence, the HDC-Z10000 features Panasonic's unique Double 3MOS System, which produces superb color and detail reproduction. Featuring two high-sensitivity 3MOS sensors (with an effective pixel count of 6.57 megapixels each) that are independently mounted left and right, the Double 3MOS system creates outstanding full HD 3D video content. Using Full-HD image quality backed by the accurate colors, meticulous detail, and high dynamic range that distinguish the 3MOS sensor, separate images are recorded simultaneously for the left and right eyes. The advanced image sensor separates the light received through the lens into the three primary colors – red, green and blue – and processes each color independently. As a result, the Full HD 3D image quality is outstanding. Naturally, the 3MOS System provides the same effects for 2D, achieving precise and sharp Full HD 2D image quality in combination with progressive recording. The HDC-Z10000, with a newly-developed and ultra-high speed Crystal Engine Pro II engine powers the high-speed processing needed to create superb image quality both in 2D and 3D images. The HDC-Z10000 features new F1.5 lenses that excel when shooting in low light conditions, and allow the user to record bright images with reduced noise. For the first time on a Panasonic camcorder, the lenses feature Nano Surface Coating, which is microstructure film with an ultra-low refractive index on the lens surface, greatly reducing the light reflection and thus reducing ghosting in order to produce crisp, clear image rendering. With a 32mm wide-angle lens, the HDC-Z10000 is extremely versatile and also has a 10x optical zoom while shooting in 3D or 12x optical zoom while shooting in 2D. When shooting in 2D, HYBRID O.I.S. helps to correct handshake that occurs when shooting while zooming or walking, in addition to horizontal, vertical, yawing, and pitching four-axis correction. When shooting in 3D, the system activates POWER O.I.S., which helps to suppress handshake, especially helpful while zooming. The HDC-Z10000 excels both in performance and ease-of-use – thanks to extremely flexible operating options. For more advanced users seeking professional-level control, there are enhanced functions, such as three independent rings for adjusting the zoom, focus, and iris control. There are built-in microphones for recording Dolby Digital 5.1-channel surround sound/2-channel stereo, the HDC-Z10000 features two XLR audio inputs with a 48-V phantom power supply for external microphone use. Clear audio is recorded with minimal noise. Uncompressed Linear PCM (2-channel only) is also supported for recording original sounds with extremely high fidelity. Plus, a dedicated dial lets the user finely adjust 3D convergence (parallax). Frequently-needed features, such as O.I.S. ON/OFF, Color Bar ON/OFF, Zebra Pattern Display, 3D Guide Display, Auto/Manual Iris, Auto/Manual Auto Focus, and Auto/Manual White Balance are available on the side of the body as separate buttons for quick, intuitive access. The Panasonic HDC-Z10000 will be available in black and the pricing and availability will be announced approximately 30 days prior to shipping. For more information about Panasonic camcorders, please visit www.panasonic.com. Where is my AF-S DX Zoom-Nikkor 30-300mm f/1.5-2.8G IF-ED VRII !!! Haha, I know this is for a camera with sensors that are smaller then APS-C, but if they can make this 3D stabilized lens with a 1.5-2.8 speed, they should be able to make a DX lens that is at least f/2.8-3.5 in the 28-200 or 18-150 range. yah it will cost 2.5K but how cool would that lens be! Yes, 3D is absolutly fantastic and offers a big improvment to visual experience. but honestly I more need a compact camera with video functionnalities (HD of FullHD). I'm waiting for the new 3D compact camera announced by Panasonic and hope: It will have a better CCD/CMOS than its predecessor Fujifilm FinePix Real 3D W3 (particulary in low light), more responsiveness, better macro capabilities. But for the rest, 10+ Megapixels, the 35-140mm, the OIS, same size, same baseline (7.5cm, very important), same screen (please NOT a Touch-screen, but enough external controls) as the W3. And ok for AVCHD format, but only Progressive, not interlaced which is not interesting. Or both AVI+AVCHD. A compact camera has only one LCD at the rear, but it's the better in ergonomy, you hold the camera by the two hands and see at the rear (important, a clear LCD, [which is hard with the parallax barrier]). The big question after all these releases : Will 3D last ? Many people with little or no experience with 3D shooting think that the lens separation of two lenses for 3D shooting always should be approx. 65 mm. The proper lens separation is for the most part depending on the distance between the camera and objects closeby and the distance to objects further away and can vary a lot. When shooting 3D inside a house with objects closeby of 0.8-1 meter and far away objects of 5-6 meter then a lens seperation of 30-40 mm is often, depending on much more factors then just the distance to the objects, fine. I guess this is exactly the 3D range this camcorder is designed for. When shooting macro, another goal of this camcorder, then you can't have objects in the scene at 0.4 m closeby and other objects at 1 meter, so then all objects must have approx. the same distance from the lens and if this is the case you can get perfectly away shooting at less then 0.5 meter with 30-40 mm lens seperation. When shooting outdoor it is the same as indoor shooting, the distance to closeby objects is the number one parameter for the lens seperation so when shooting to object closeby then again 30-40mm lens seperation is fine. Yes, when shooting on top of a hill with the closest tree or lump of stone at 500 m distance then the 3D effect with this camcorder is almost zero but please keep in mind that with such conditions even 65mm lens seperation is far from enough. Bottom line, shooting 3D is really a matter of choices, you can't have it all with one fixed setup and regarding this all major manufacturers of 3D gear are knowing exactly what they are doing. That said it is a pity and a big shame that none of them don't have an open and transparant communicating with the market and teach them about the problems and issues of shooting 3D to get more understanding, if they did you would immidiatly understand why 30-40 mm for a 3D camcorder is fine. I recently made the same point on the 3D photographic forum. I soon noticed that my bloggie 3d camcorder produced excellent 3D when viewed on my TV, deeper 3D than when viewed on a laptop. I found this a really excellent explanation of lens requirement versus distance both when taking and when viewing 3D video/stills. Actually it's a matter of geometry. To achieve what the eye would see you need to be closer by a factor of two (which probably means shooting with a wider angle focal length). If you're doing landscapes you probably want a slide bar and hyper vs. hypo stereo separation is a matter of preference. For creative control (and this is closer to a pro camera), I'd like normal eye separation or adjustable. Some after market people (cyclopital3d comes to mind) may offer this. Good thing it has the number 10,000 in the name. No one would take it seriously otherwise. But I think I'll wait until the HDC-Z10000000000 comes out. That one I hear, will be the bomb, with full 4D 9080 10000P video, using AVHCD 99.0 standards. It produces stellar 4-D imagery directly to the brain. No human eyes to mess up the signal chain needed. With all of these manufacturers coming out with 3D cameras and camcorders, I'm wondering why almost none of them are publishing the camera interocular (interaxial) distance between the two lenses. Is it because they think this is not important information to the user, or is it because they are not anxious to divulge a serious design trade-off? I am waiting fora product that will allow me to capture 3D with a lens separation of somewhere near 65mm- which happens to match the distance between most adults' pupils). Does anyone know what the distance for these new Panasonics will be? Some manufacturers do: Sony lists the I/A on the TD300 as 45mm, and 31.8 mm for the NX3D1U. Average adults pupils are 54-78mm apart. With small, one-piece cameras like these, most people will be shooting 3D elements which are closer to them, making a smaller I/A more useful than a wider one. Nice features. This beast has got to retail for at least $2500 - $3000. 3D is here to stay. Soon 3D glasses will be a thing of the past(think nintendo 3ds) and it will be on every TV(think 1080). Its just one of them things. 1080 are the horizontal lines which provide the vertical definition, for example the SBS video format used in broadcasts reduces the definition to 960 X1080 for each eye.